Durable Technologies supplies easy to use, economical, spindle-actuated permanent marking devices for a multitude of materials, from tool steel to thin walled plastics. These devices do not rely on electrical or compressed air input and are easily integrated into horizontal and vertical machining centers, and similar CNC machines using a rotating spindle. The Durable Technologies CNC marking solutions are a cost effective alternative to dot peen markers and other part marking alternatives such as etching, die or roll stamping, laser markers and difficult to maintain ink jet printers. Click on either of the links to the right for more information on our line of CNC Marking Tools. You can also contact us now to speak with someone in Sales. 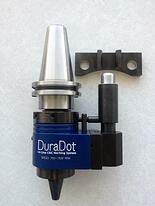 The DuraDot® is a spindle-actuated mechanical dot peen marking attachment for use in CNC machining centers. It creates alpha-numeric characters, logos, bar codes and much more in precise low stress dot patterns. The DuraDot® does not require compressed air or electric. It easily integrates into vertical or horizontal machining centers, milling machines and similar CNC machines with rotating spindles. It can be manually loaded or traverse through automatic tool changer processes. 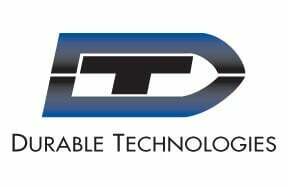 Click here for more information on our DuraDot®. With the Inline CNC Marking Head it’s possible to mark the part while it is still set up in the machine, eliminating costly secondary operations, additional equipment and labor. The patented in-carousel design and compact size easily position the inline marking head in the tool magazine or turret without interfering with machine components or work piece. Click here for more information on our Inline CNC Marking Head.